Your first pisco sour is just half a day away. Ah, Valpo. Don't you ever change, y'hear? Chile is just 12 hours direct from Australia. One easy flight. Who knew? When you consider that many Australians think nothing of going to places like Hong Kong or Singapore for a long weekend, what's the extra couple of air time hours for a short escape? Or a long one. I visited Chile in 2016 more or less by accident. After working at the Rio Olympics, I needed a few days down time. Wow. What a great decision. I want to go back and see more. Know what my favourite bit was? It was the both of the places I visited. The first was the port city of Valparaiso. The second was Portillo ski resort, one of many well-developed ski fields in the Andes just two hours from Santiago Airport. Here's a picture of each place to get you going. First, "Valpo" (as the locals call it). The hills are steep, but walking up a few of them is a good excuse to eat more ceviche and empanadas. Second, the view from my hotel room at Portillo ski resort, high up in the Andes by the gorgeous Laguna del Inca. Jealous yet? This is real. This was actually my view. And every room in the hotel has a similar view. Chile is a vast country. Though narrow from east to west, its north-south axis is 4,200 km, which means it stretches further than Australia's entire east coast. Chile has the world's driest desert (the Atacama) up north. There's the icy wilderness of Patagonia down south. There are great bits in between like the Lake District. And of course there's the capital, Santiago. 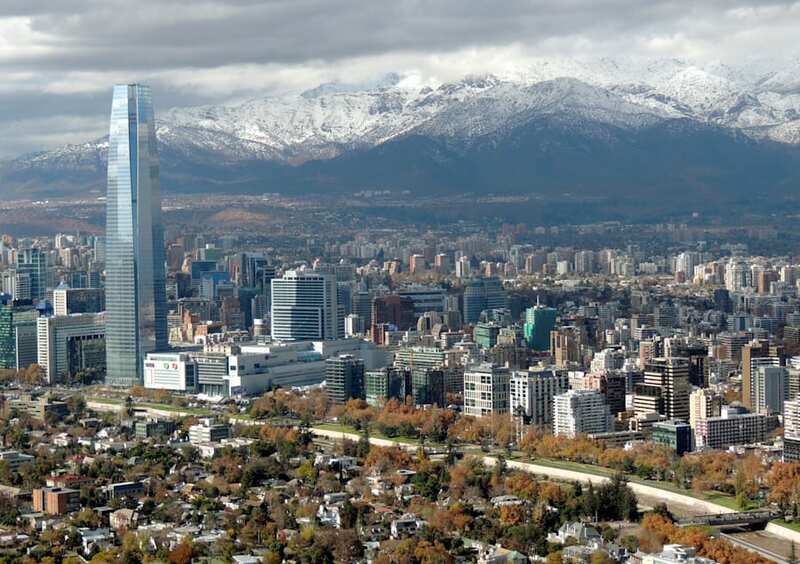 Didn't go there (except for the airport), but Santiago is said to be an amazing, modern city. But I didn't have time for any of that. 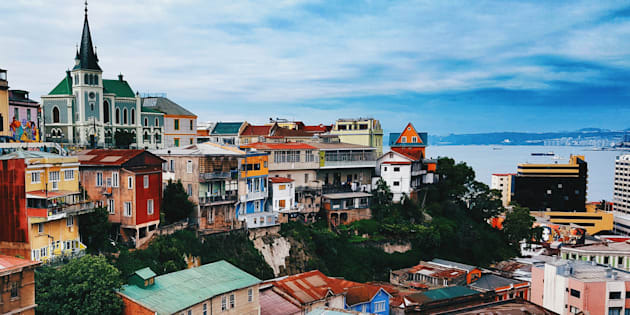 With just six days, I took two quick buses from Santiago Airport to Valparaiso, the gorgeous port city set in a natural amphitheatre of hills overlooking the busy working port. Despite speaking no Spanish (or the version of Spanish the "Chilenos" speak) I coped fine. Valpo is cool central. Cool people are everywhere. Great little bars and cafes are everywhere. Artists and their galleries are everywhere. Street art is everywhere. We've all had days like this. Valpo hits the perfect note. In terms of the vibe, this is absolutely the closest thing you'll get to Europe within one flight of Australia's east coast. The architecture can feel a little European too. And those colourful street facades are so upbeat. This is a city where you want to walk down every street just to see what's round the corner. But of course, there is a distinct local flavour here. One plate of the amazing lemony raw fish dish (ceviche, which is kind of like sushi) washed down by the amazing salty lemony drink (Pisco Sour) and you'll know you're in South America. These are the more delicate culinary options. Steak the size of a small continent washed down with pints of beer are just as popular. I stayed with friends in Valpo at their fabulous apartment, which is also an Airbnb. If you want to live it up a little, there are boutique hotels galore down near the port. That's where all the nightlife is too. Valpo is one rockin' city at night. Maybe a little too rockin' for some but you can avoid all that by staying up the hill a bit. Talking about hills, if you've had a pisco or three and you don't feel like walking home, Valpo has at least 14 of these ingenious things (called "ascensors") to help you get home. They're so cheap , they're almost free, too. Three more things you have to do in Valpo: Go down the harbour and watch the seals. They're hilarious and surprisingly incompetent. Visit the home of the great Chilean poet Pablo Neruda. It's eclectic as hell and has the best views in town. And take a train along the coast to Viña del Mar, which is where the cool beachy people hang. The cool snowy people? Ah, well they're all up at ski resorts like Portillo. You've already seen the lake from the hotel room. Now behold its beauty from the ski slopes. Yes, that's the author of this article. Yes, he wishes he was there now. I've skied pretty much my whole life but have never been anywhere like Portillo. Big mountains? I've skied them before. Uncrowded slopes? Yep, them too. But there's a feel to this place of pure space. I've shown the photo above to a lot of people since last August and they always say "where are the chairlifts? Where are the people?". The ski lifts are there, just out of view. So is the ski village with its gorgeous hotel where they serve amazing seafood (among other dishes) because the coast is only a couple of hours away. But at Portillo, you always have your own patch of snow to yourself, or in many cases, an entire mountainside. Here's one more pic. This is me again, being a little daring. I survived. Just. If you're a less adventurous skier and are worried that the entire Andes ski experience is extreme stuff like the pic above, think again. There are plenty of open, easy slopes like the one below at Portillo and other nearby resorts. This is the Plateau chairlift at Portillo. Ever seen a steep plateau? Point taken, we hope. Prices are reasonable too, which makes Chilean skiing a pretty good Southern Hemisphere option for Aussie skiers who are sick of our own unreliable snow seasons and the lack of on-snow accommodation in New Zealand. We're pretty sure you won't get slopes like this at Perisher or Falls Creek. Anyway, this was all a bit of a taster. In six days, I thought it was best to do a couple of spots in Chile properly rather than try to dash around and see half the country. Travel is always better that way, don't you think? Overall I found Chile an easy and safe country in which to travel. The political climate there is relatively stable right now and the people -- while not as instantly warm as the Brazilians -- will do anything for you once you've broken the ice. The best part? As mentioned, it's just 12 hours away. You should know that Qantas has not in any way sponsored this story, and indeed has no idea we've written it. But you might also like to know that you can get from Sydney to Santiago in winter for less than $600 each way if you book now.